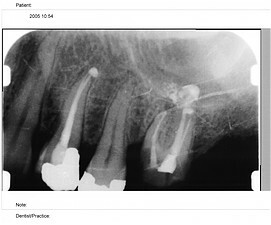 Digital x-rays are quickly becoming the standard in dental imaging. Just like traditional radiography, digital radiography is the most commonly used diagnostic tool in dentistry. An advantage of digital radiography is having an image created and electronically stored instantaneously utilizing a very minimal doage of radiation. After the image is acquired, it can be manipulated to further enhance it's diagnostic value. Digital radiography is not only patient and operator friendly, but also environmentally friendly as the use of processing chemicals is eliminated as opposed to traditional radiography.